Form factor: 9.7″ feels like an organizer, very handy, but also still big enough to use for note-taking in meetings, lectures or on the go (e.g. in the plane on the train). Special: Chrome OS runs Android Apps now. Form factor: 10.1″ a bit smaller than a normal sheet of paper, thus handy, but still big enough to use for note-taking in meetings, lectures or on the go. 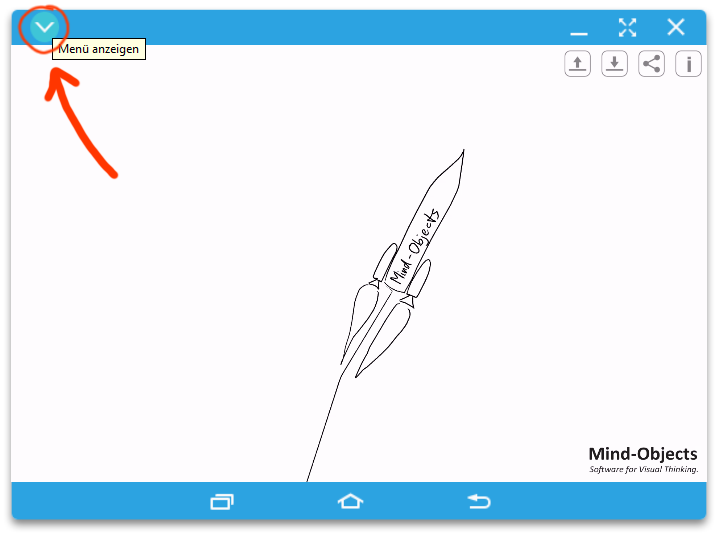 If you happen to know any further android pen-tablets let us know! If you own one of the listed devices: go to our play store page and download the 14-day free trial of Mind-Objects Think Visual. It is the best support for visual thinking you can get: capture, structure and share your thoughts effortless – with no space restrictions! Using the software is as intuitive as using pen and paper, with the advantage, that information can be restructured easy and be broadcasted via a projector. This saves time, enables better results and helps collaboration in meetings. 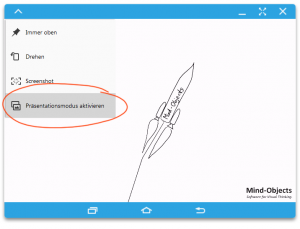 Mind-Objects Think Visual runs on any pen-enabled Android tablet (if you have a device without native pen support you can use Mind-Objects ThinkVisual Touch instead). Why did we choose these devices for Mind-Objects? If you have any questions regarding the above devices or where to buy them – write us in the comments or . 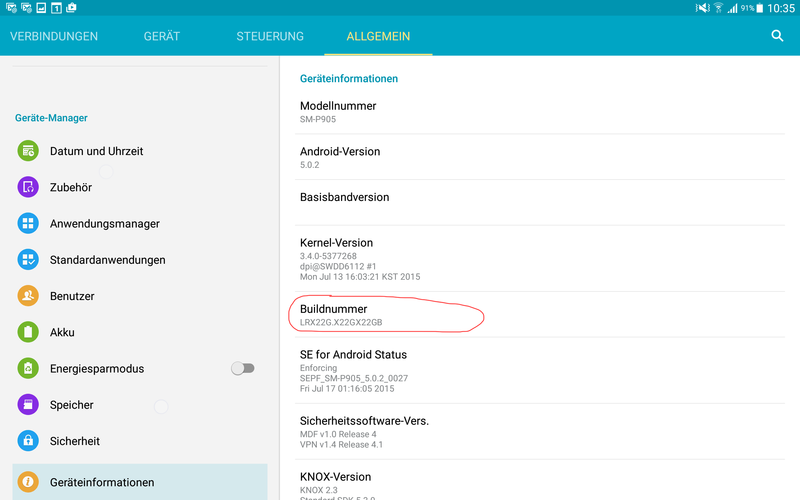 You have a Samsung GALAXY Note Tablet (e.g. GALAXY Tab A 9.7, GALAXY Note 10.1. 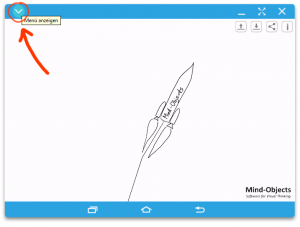 (2014 Edition) or GALAXY NotePRO) and want to connet it with a projector, TV or any other screen? There are several ways to do that. 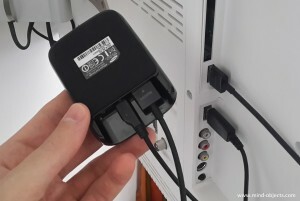 Since most of todays projectors, TVs or screens have either an HDMI or VGA connector we focus on solutions for these two. We propose the three best ways for each in this article. 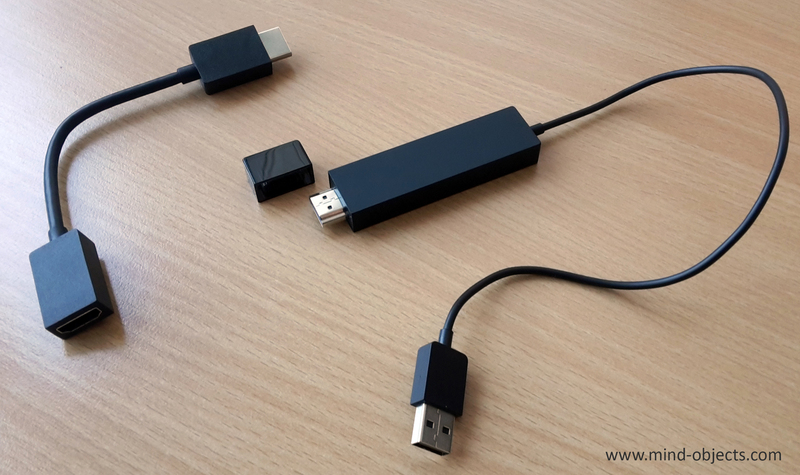 For screen mirroring we also use the Microsoft Wireless Display Adapter V2. The setup is as easy as using the Samsung AllShare Link Cast Dongle and our tablets showed the adapter in the notification panel as well. 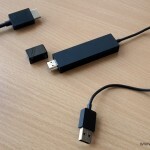 The Wireless Display Adapter does seem to work with any HDMI-cable which makes it even more reliable as the AllShare. We also tried the Google Cromecast with an HDMI port (may also work with an VGA Converter but we din’t try yet). Our experience was mixed: while mirroring the screen from the tablet to a TV the screen froze after a few minutes. 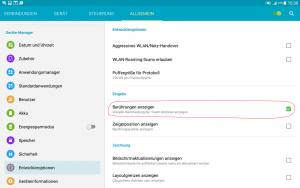 Further the chromecast only works when connected to a local WLAN – which may not be available at every location you visit. 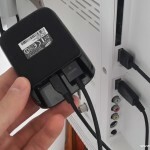 Using an MHL Adapter is one of the easiest ways to connect your Samsung GALAXY NotePRO or GALAXY Note 10.1 (2014 Edition) with any other screen, projector or TV via HDMI. 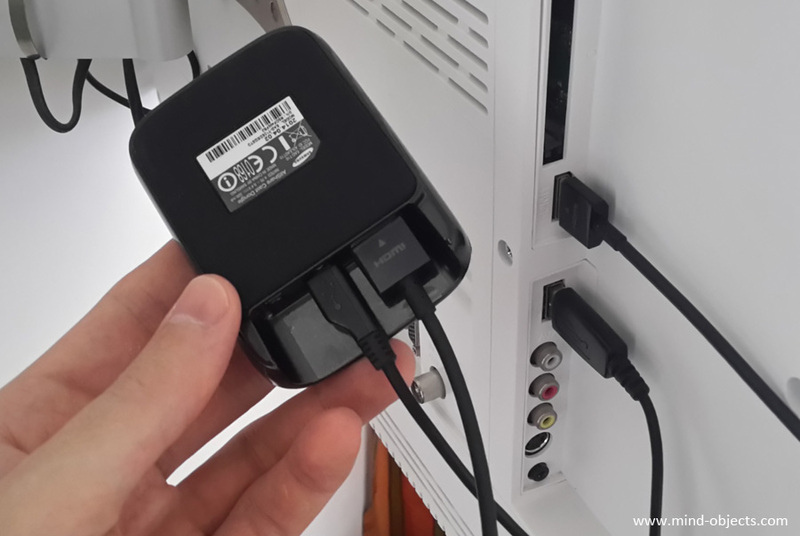 We tested the Samsung HDMI-Adapter MHL 3.0 EE-HN910. 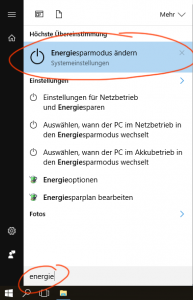 With our devices it worked with and without an aditional power source (not shipped with the adapter, you can use the one from your smartphone). We tested it with Full HD screens and different projectors. The order in which you connect the different cables didn’t matter either. So it’s fairly simple: just connect the different cables and the screen mirroring starts automatically. 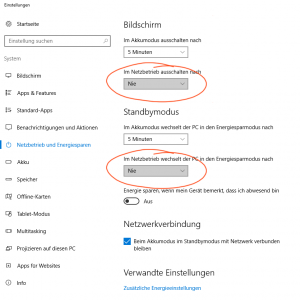 If you prefer connecting your device wireless have a look at our respective howto. 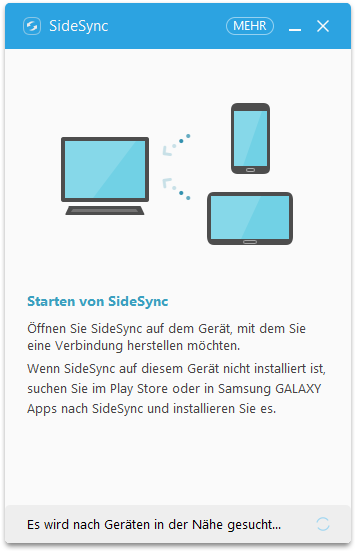 To install SideSync download and install the software from http://www.samsung.com/us/sidesync/ on your PC or MAC. 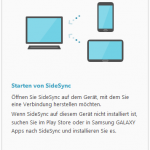 Install the SideSync App https://play.google.com/store/apps/details?id=com.sec.android.sidesync30 on your Tablet. 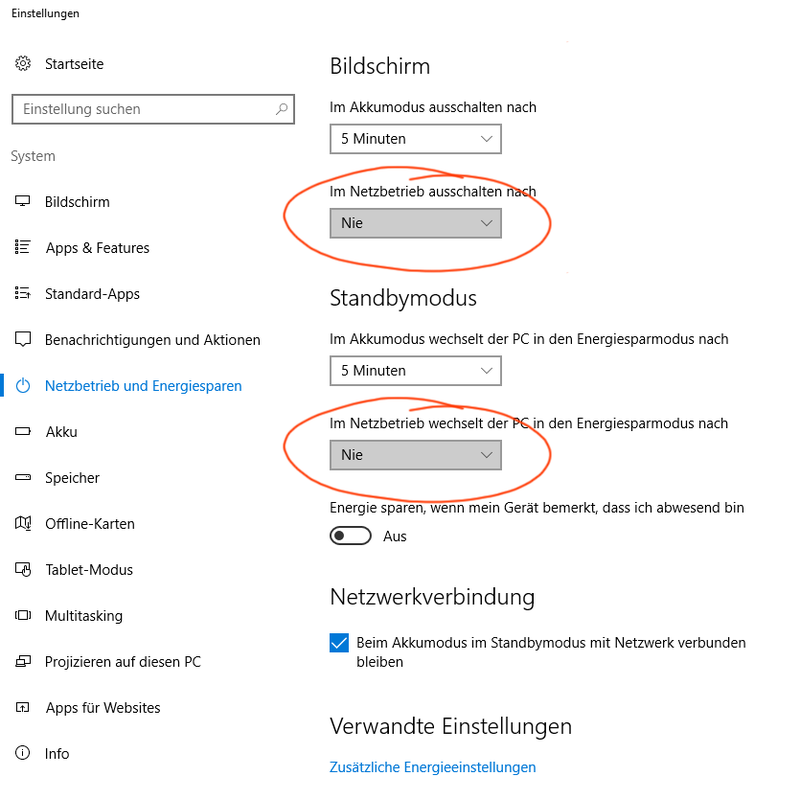 Connect your tablet (Android 5 or higher required) and your PC or MAC device with the same WLAN. 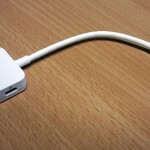 Connect your tablet (Android 5 or higher required) and your PC or MAC device using a usb-cable. The advantage: your image quality is better than using WLAN. Normally SideSync automatically builds up the connection to your tablet, but you can also start SideSync on your tablet manually. 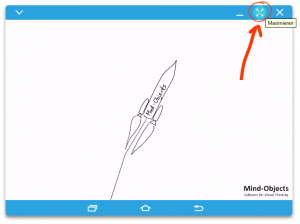 2) Hit the button “Tablet screen”. Now you can see the screen of your tablet and interact with it. But you won’t see anything on the tablet and thus not yet be able to use the S-Pen. 3) Open the menu in the upper left corner by pressing the arrow button. 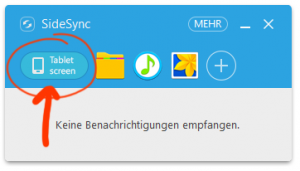 Now you can use your tablet as usual with the S-Pen and your screen is being displayed on your PC or MAC. or (via internet) through using any online meeting software like Skype / Webex / Adobe Connect etc. Have a good meeting or presentation! For any further questions don’t hesitate to write us in the comments below or . We are happy to help you! 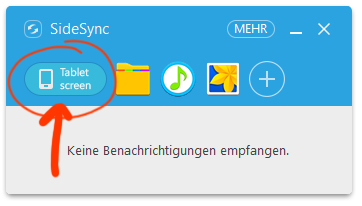 We prefer using the notification panel, since you are way faster, than when you open up the settings menu first. In the beginning of the video, we show you how to configure your notification panel for this purpose. If you have any questions or need further information please use the comments below or. We are happy to help you! 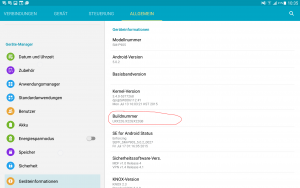 If you share your Android tablet screen with an audience (e.g. 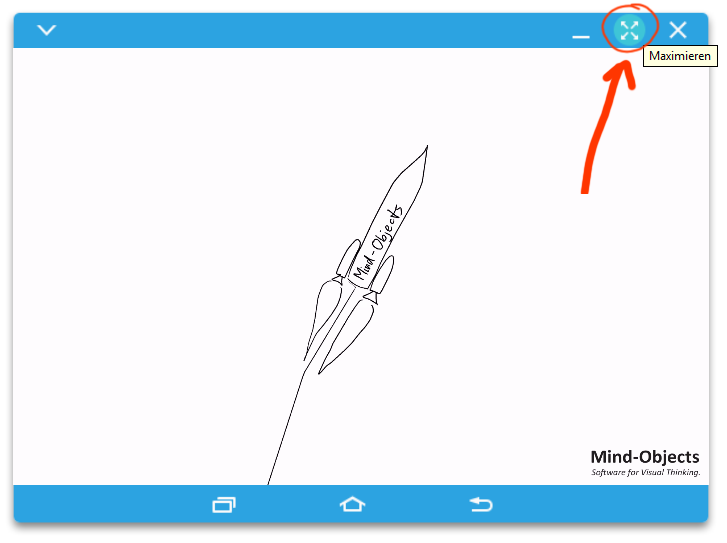 for a meeting or presentation) it is helpful to enable “Show Touches”. Why? Because your audience can see how you interact with the device (e.g. when you start zooming or panning). This awareness helps them to stay oriented and engaged in your presentation. 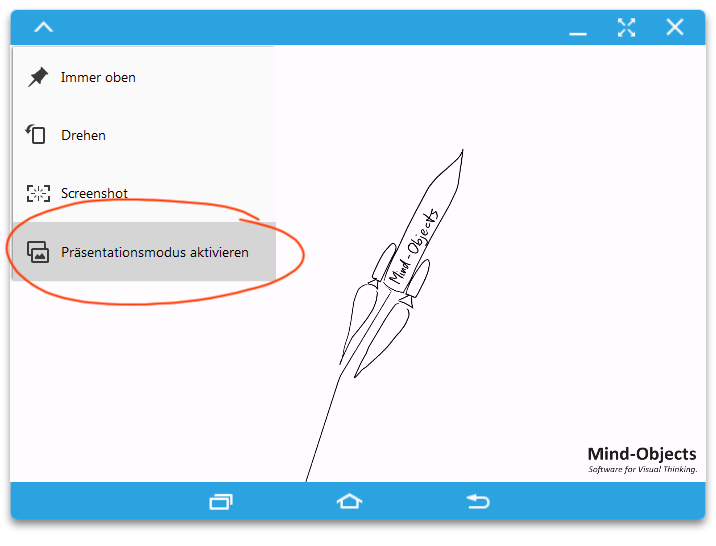 With these settings, all interactions with your device are shown to an audience (Touch and S-Pen). This is especially helpful if you use Mind-Objects during meetings or presentations.